Denver Broncos CEO Joe Ellis at a press conference on Monday, December 31, 2018. ENGLEWOOD – On a day when 15 modern-era candidates join Broncos owner Pat Bowlen on the Pro Football Hall of Fame final ballot, it’s fair to wonder: What would Mr. B think about the current state of his Denver Broncos? Not once in Bowlen’s 30 years at the Broncos’ active, day-to-day owner did he experience back-to-back losing seasons. Not once. They have now after the Broncos went 5-11 and 6-10 in their past two seasons. “He’d be disappointed," Joe Ellis, who became the Broncos’ controlling owner after it was announced prior to the 2014 season Bowlen was dealing with Alzheimer’s, said in an interview with 9NEWS. “He’d create a sense of urgency. As he would say, ‘I don’t really have to create a sense of urgency because you all know that there’s a sense of urgency.’ That would be enough of a message. 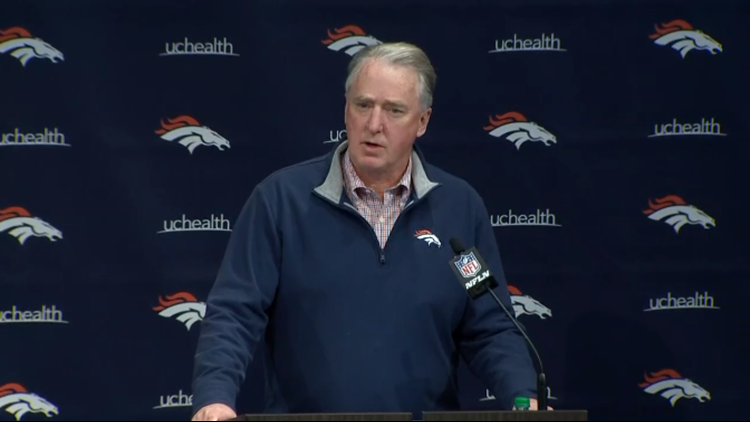 “I think that point is very clear to John (Elway, the Broncos’ general manager) and very clear to me. I have to do a better job of helping John and supporting him." There is a succession plan to the chair Ellis sits in temporarily. The Pat Bowlen Trust assigned Ellis, general counsel Rich Slivka and attorney Mary Kelly as trustees with the request to choose one of Bowlen’s seven children who has earned the right to succeed him as controlling owner. Beth Bowlen Wallace, Pat’s second oldest daughter from his first marriage, wants the job. Beth announced her intentions last May 31. The trustees have all but dismissed her as “not capable or qualified,” while Brittany Bowlen, Pat’s oldest daughter from his current marriage to Annabel, is working toward assuming command. A possible scenario: Ellis runs the Broncos through the next collective bargaining agreement in 2021, then turns the team over to Brittany, who turns 29 in the next week. “I don’t have an exact timetable for myself and don’t know what Brittany’s plans are specifically," Ellis said. “She’s working really, really hard at McKenzie and Company, a global consulting firm that is giving her tremendous experience. She is putting in a lot of hours, 70, 80 hours a week travelling all over the country, working on projects, really getting some tremendous experience. It’s a big job. She is going to have to come in here and earn it and prove herself. Her father was very, very specific about that with each child." Ellis was asked point blank: Is Brittany the one you’d like to see take over? “She’s doing a lot of good things," he said. “I’m not going to pinpoint or put pressure on her to say she definitely has to be the one. She wants to try and do it. She announced that last fall. There will be a role for her at some point for sure. She has some skills that I think will help us in certain areas. I don’t have a timetable on that and I really don’t have a timetable on myself other than I think we need to try and move this along as expeditiously as we can." Two years ago, when the Broncos interviewed three candidates to replace head coach Gary Kubiak, who stepped down because of health reasons, the team’s search committee consisted of Elway, his right-hand man Matt Russell, public relations boss Patrick Smyth, football administrative assistant Mark Thewes and Ellis. This time, Ellis is not part of the interview group as he wants to empower Elway with the hiring decision. Ellis did meet privately with Chuck Pagano, the first candidate to interview Wednesday, but the Broncos’ president will not accompany the search committee for its interview tonight with Los Angeles Rams quarterbacks coach Zac Taylor near Van Nuys, California. “I want John to have an audience that’s a little bit narrower, so he can ask the questions and get a real feel for the coach and not feel any outside noise that I might bring, or extra people might bring," Ellis said. “We don’t need a search firm. It’s important for John to sit down with our next head coach whoever he thinks -- actually all of the candidates that he feels is a viable candidate to succeed. “He’s got to spend one-on-one time with him to make sure he knows he’s got the right guy. Because John knows what it takes. He did it as a player, he’s done it as an executive, his dad was a coach. He knows what it takes, and I have great faith he’ll deliver us the next head coach and a good coach." Will the state of Broncos ownership -- Bill Bowlen, Pat’s bother, has filed a lawsuit against the trustees -- hurt the team’s ability to get the coach they want? “I didn’t think it will," Ellis said. “I think this is a great job to have. It’s a great place to live. I think as an organization we’ve made it very clear we give a coach all the resources that he needs to succeed. You add to that the core of young players, solid veteran guys you get the kind of coach who believes that he can teach players and put them in a position to succeed and win, that’s the kind of coach we need to find. “And I think he’ll be excited to work here. So, I don’t think the lawsuit has any effect on this decision at all."